Time is a subject that has always fascinated and tortured me. Let’s get the latter over with first. I have the curse of always being early or on time. I am usually waiting for someone or am embarrassed by reaching someone’s house too early. I am obsessive about deadlines no matter what they are. I have always blamed this on my parents’ German background. I remember being seriously late once (45 minutes) and my hosts were getting ready to call the police! My father always said, if people are usually late, once in a while they should also be early, but it is never that way. I realize now that this is because they use every minute at their disposal to accomplish something while I am standing on one foot waiting! The corollary is a lack of patience that I also suffer from. When our son was a child he was diagnosed with Attention Deficit Disorder (ADD) and I realized that I have always suffered from the same problem which makes me a good multi-tasker but horrible in the patience department. We also learned, that there are always some things that such an individual can concentrate on. In a child it maybe video games: for me it is art that I love. 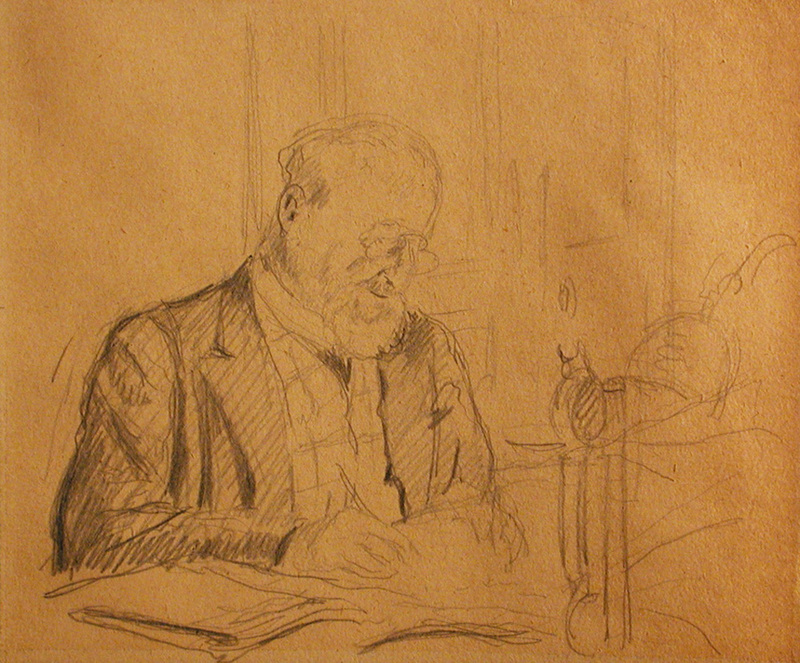 For instance, some years ago we sold a drawing by Edouard Vuillard (1868-1940). Since none of the players are alive anymore, I think that I can mention the names. We acquired it from the Richard S. Davis Collection, a well-known collector and former director of the Minneapolis Museum of Art. We sold it to another renowned collector, John Gaines. When the latter decided to sell it in a public sale, the auction house told him that the expert who was writing the catalog raisonné did not recognize the drawing as by the artist. John Gaines came back to me and, of course, I bought the drawing back. Then I set to work. I researched the provenance and learned that Richard Davis had acquired the drawing from a most reputable dealer in works on paper, Lucien Goldschmidt. The portrait was of Thadée Nathanson whom Vuillard and other artists of the Nabis school drew and painted. The best known images, however, are from around the time when Nathanson and his brother published the Revue Blanche (1891-1903), an arts journal of the time. I then took the drawing out of its frame and saw that the sheet had been torn out of a sketchpad. I sent all that I had found to the same expert that the auction house had been in touch with. In due course, I received his expertise authenticating the work as by Vuillard, and the subject as Nathanson. Because of the sitter’s obvious age in the drawing the date must be about 1930. The auction houses get so much to deal with that they cannot always do what is necessary, but I was determined and invested the time and effort to prove my conviction of the drawing’s authenticity. It is kind of exciting being an art detective and that is what the collector must do as well. You want to know as much as possible about a work of art that you wish to acquire both before and after it’s acquisition. Not just is the price right, though this is important, the more passionate a collector, the lower down it will be on your priority list. After hitting the books and if possible, asking scholars for their opinion, you need to weigh the evidence and then you make the final decision. Usually by repeating the process over and over again our decisions become better and more informed, but still, in matters of art, I have found that an investment of time pays off.